Starring traditional Christmas flavors, this simple but nourishing Christmas pudding is also free of gluten and refined sugar. It even uses coconut oil instead of suet. And the best part? The Instant Pot makes this pudding so quick and easy! This may just be the year to include a Christmas pudding in your holiday feast! Starring traditional Christmas flavors, this simple but nourishing Christmas pudding is also free of gluten and refined sugar. And the best part? The Instant Pot makes it so quick and easy! This is the year to include a Christmas pudding in your holiday feast! Serves 12 to 14. Easily halved*. Adapted from Hip Pressure Cooking and Gather & Feast. Combine orange, water, dates, and whole prunes in insert pot of pressure cooker. If using an electric pressure cooker, set to Saute function. If using a stovetop cooker, put on burner over medium heat. Simmer for 10 to 12 minutes, or until dates and prunes are plump and very soft. For an electric cooker, turn off. For a stovetop cooker, remove from heat. Then stir in coconut oil. Grease a 6-cup heatproof bowl that fits inside cooker. Then, when date mixture has cooled, puree in a food processor or blender. Stir in other dried fruit (including chopped prunes), grated potato, grated carrot, honey, eggs, vanilla extract, and spices. Once combined, stir in flour(s). Then pour mixture into greased bowl. Clean insert pot of pressure cooker. Then add trivet and 2 cups water to bottom of insert pot. 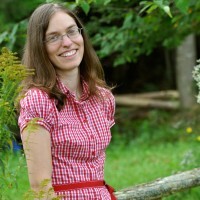 Using a foil sling (see how to make a foil sling here! ), carefully lower bowl of pudding ingredients into pressure cooker. Cover with lid, leaving the sealing valve open so it can vent. Then, if using an electric pressure cooker, set to Saute function. If using a stovetop cooker, turn burner down to medium-low. Then steam the pudding for 15 minutes. After steaming, seal the release valve of cooker. If using an electric cooker, turn off from Saute cycle, then set to high pressure for 35 minutes. Then, if using a stove-top cooker, bring to high pressure and maintain pressure for a cook time of 35 minutes. Once cycle is complete, if using an electric cooker, press Cancel and let naturally release for 30 minutes or up to 1 hour. If using a stovetop cooker, remove from heat and let natural release for 30 minutes or up to 1 hour. When ready to serve, remove lid. Then carefully lift pudding out from the cooker, using the foil sling. Finally, serve warm with whipped cream or coconut cream. Enjoy! *To feed a smaller group, halve recipe and cook in a 3-cup bowl. Steam for 12 minutes. Pressure cook for 20 minutes. Serves 6 to 8. 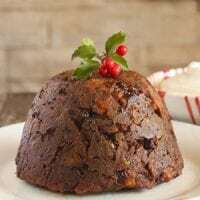 Have you ever made a Christmas pudding? 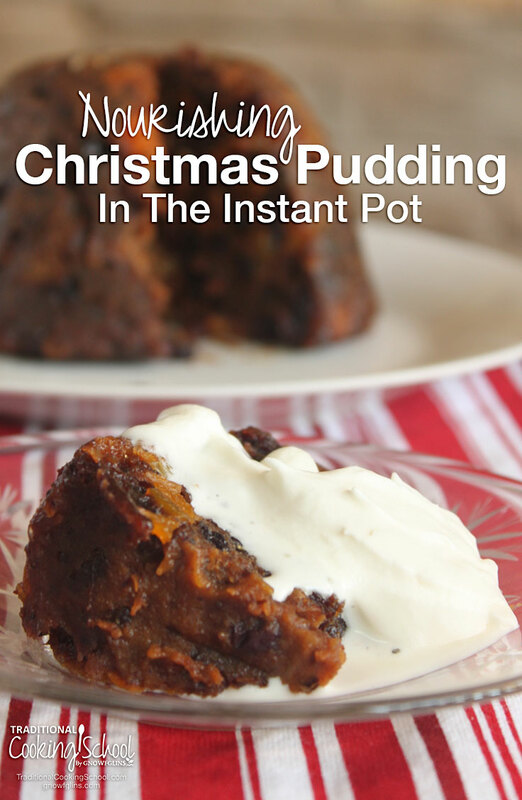 What about a Christmas pudding in the Instant Pot? Sounds wonderful! Question though: any suggestion for a suitable substitute for the flour called for here? (Family member can’t do grains — but can do almond and/or coconut…. if that form might serve, any recommendations on measures for the purposes of it in this recipe??) Thanks!! You can definitely use almond meal. One of the recipes I adapted this from used 350g of almond meal (about 3.5 cups). With the differences between the two recipes, I don’t think you would need as much – maybe 2 cups? Hi Kelly, I haven’t tried reheating in the instant pot yet, however, traditionally to reheat I would just steam the pudding again, until heated through, You could do the same thing with the steam function on your Instant Pot. I am sure you could also do a combination of steam/pressure cook, but not having tried it I don’t know exactly what times of each would be optimal. Am I correct to assume you cover the actual bowl with the mix in it inside the pressure cooker during the steaming and the pressure cooking phases – ie with lid of mixing bowl or foil or some other cover? This is the only detail that is not explained? No, I actually don’t cover the bowl when I make it in the instant pot. When I use the stovetop steam method I would cover it with parchment paper or muslin. When I transferred to the instant pot, other pudding makers suggested cooking it uncovered for the best texture, and it worked well for me! Thank you. Mine is a stove top pressure cooker so I will cover. But I will do the initial steaming bit uncovered. In this recipe we are cooking at high pressure. That could be a factor between the two recipes. Also, our recipe calls for the natural pressure release which impacts cooking time. Do you chop the whole orange and add to the batter? According to the recipe, you’ll want to peel the orange (and discard the peel) first. Then chop the orange slices and add that to the batter.